For some twenty years now, Austrian multiinstrumentalist and composer Gandalf enjoys international recognition as a modern magician of sound. Since the relase of his 2005 album „Barakaya“ he also is an esteemed member of the Prudence label family. Gandalf’s masterpiece „Samsara“ deals with a central topic: reincarnation. In indian philosophy „Samsara“ is the wheel of eternal return/rebirth – the human being trapped in the illusions of the material world and its pleasures and ordeals. 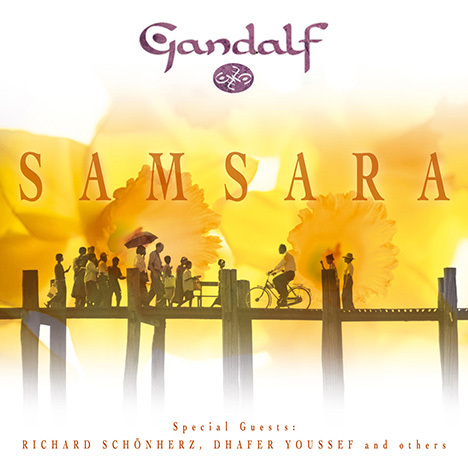 The album was born out of the cooperation of Gandalf with singer, keyboardist and writer Richard Schönherz (known for his works with André Heller) and fascinates with an extraordinary blend of ethnic-, pop- and world-music. Prudence will issue it now with several previously unreleased tracks and in a beautiful new artwork. 18 more albums of Gandalf found. Schnell, Carsten "Moments In The Past"